Nintendo's next president, Shuntaro Furukawa, will make smartphone gaming a priority when he takes the helm of the company this June. In a new interview with Nikkei, Furukawa said that he envisions a future where Nintendo's smartphone gaming arm can become a 100 billion yen ($910 million) business. In fiscal 2017, the segment including mobile games grossed 39.3 billion yen. To do this, Furukawa plans to increase the output of smartphone gaming apps for iOS and Android devices, as well as launch a singular app that surges in popularity. Outgoing Nintendo President Tatsumi Kimishima referenced Pokémon Go as an inspiration for this plan. Pokémon Go was a collaboration between developer Niantic and The Pokémon Company, which Nintendo has a joint investment in. "From what I can see, smartphone games are the ones I want to expand the most," said Shuntaro Furukawa. "The idea that something will emerge that transforms into something big, in the same manner as game consoles, is the defining motive of the Nintendo business," he said. When asked if any of the upcoming apps would adopt Pokémon Go's augmented reality gameplay, Furukawa said that he "can't say that there are any that are like that." It's also unclear if the plans for the singular, so-called "game-changing hit" would include existing Nintendo characters or be entirely original. Nintendo has already begun adding on new developer partners besides DeNA to work on games with new characters, while DeNA continues outputting those with Nintendo IPs like the upcoming Mario Kart Tour. 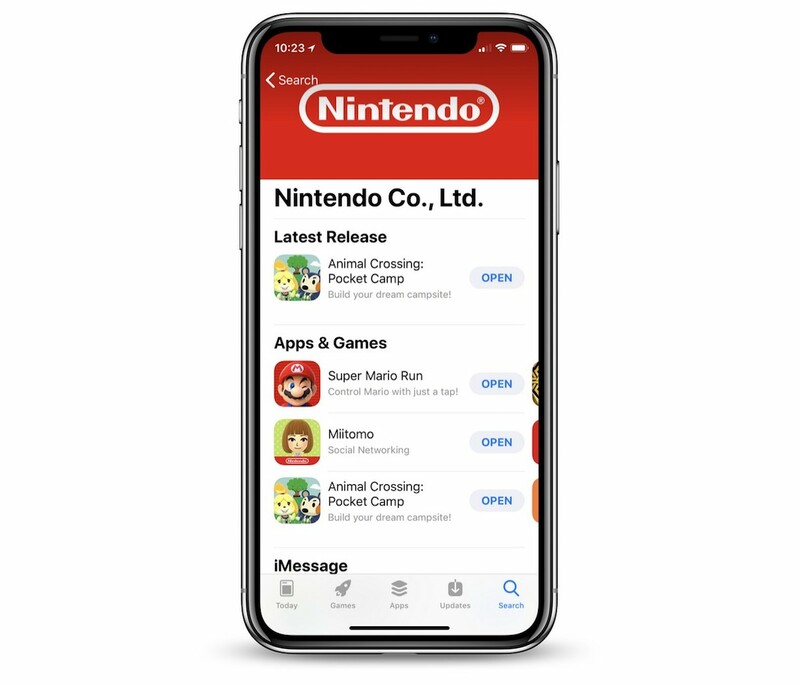 According to Furukawa, Nintendo is also gearing up to "expand cooperative ties" with its developer business partners down the road, further hinting at an increased output for gaming apps. Smartphone games that have been confirmed by Nintendo include Mario Kart Tour and Dragalia Lost, both with vague late 2018 launch dates. These will follow Nintendo's previous titles Miitomo, Super Mario Run, Fire Emblem Heroes, and Animal Crossing: Pocket Camp. In terms of unconfirmed mobile spin-offs, The Legend of Zelda could be the next big Nintendo IP to launch on iOS. Seriously, I know it's a cannibalization risk for the consoles, but it would be an instant #1 in the App Store. Work on MFi controllers and Apple TV apps and Nintendo would be set. That's all people have wanted for a decade now, since the App Store opened. Classic NES/SNES games, ported over with no additional gimmicks. I have been saying his for years, but I think both Apple and Nintendo could benefit from a virtual console type app on the ATV. But only classic games, such as the games on the NES Classic edition. I don't think it would cause a loss of sales with the switch, due to it only being retro console games. They could have a similar price structure to the classic console games on the Wii and WiiU. Which is only two words thanks to contractions. Thanks contractions! I have yet to see a quality game from Nintendo on the App Store. I will take them seriously when they make a console quality game on mobile, and not “mobile games”. Super Mario Run is actually really good. The remix mode they added is also fun when you don’t have much time to play. It’s not so easy to fully beat all the challenges and collect the last set of coins. It’s very polished and well worth the $10 I paid for it. Of course the console Super MARIO games are superior, but for their first attempt at a touch control phone game, it was a respectable effort. So the new president is going to put the core business as a second. Not saying he's wrong - but he probably is, and I don't envision a Nintendo where it survives long in the mess that is the mobile games industry as it's main priority. Nintendo has stayed visible and relevant all these years by staying stubbornly unique in it's core businesses. They will lose a huge part of their individuality by fighting it out in the chaos of the app store or Android marketplace. Especially since Nintendo on the app store was a novelty this year - in two years - not so much. Just another company putting out quick fix cash generators (so far anyway) - as apposed to more long term immersive experiences (which *may* happen). Mobile gaming should remain their side product and this guy doesn't sound very 'Nintendo' coming out with such statements. Dragalia Lost ('https://www.macrumors.com/2018/04/27/nintendo-new-rpg-dragalia-lost/') looks horribly generic - it doesn't have any 'N' about it. Ha! I'd bet dollars to doughnuts, any and everything from Nintendo from this point forward will have an IAP component. They were disappointed with their ROI on Super Mario Run, but happy about Animal Crossing and Fire Emblem. I don't see them going back to buy once. From a gaming standpoint, why would they? Virtually all the money made in mobile gaming is IAP money. I personally hate IAP and go out of my way to support devs who release pay once material. I fully understand I am in the minority. Just a guess, but Nintendo wants to reach the majority. They’re already set with the Switch. I can’t see them expanding into ATV as it is a complete cannibalisation of their own product. Expanded iPhone games, sure.